This is the first time in 18 years that HBO has failed to lead all nominations, with Netflix earning 112 Emmy nominations to HBO's 108. The streaming service has been gradually growing with 34 nominations in 2015, 54 in 2016 and 91 last year. Game of Thrones led all shows with 22 Emmy nominations. 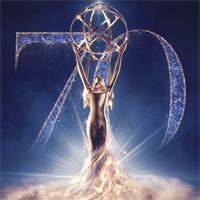 Saturday Night Live and Westworld tied for second with 21 nominations each, followed by The Handmaid's Tale (20), The Assassination of Gianni Versace (18) and Atlanta (16). Game of Thrones, which wasn't eligible last year, will battle it out with last year's winner, The Handmaid's Tale. Meanwhile, the best actress in a comedy series will be up for grabs for the first time since 2011 since Julia Louis-Dreyfus wasn't eligible as Veep was on hiatus. Black-ish's Tracee Ellis-Ross, Insecure's Issa Rae and The Marvelous Mrs. Maisel's Rachel Brosnahan are among the contenders in the best comedy actress category. Chrissy Teigen: If John Legend wins for Jesus Christ Superstar Live, "he will complete his EGOT and my spike tv award will probably be moved"
Real Time with Bill Maher was snubbed for the first time since 2004 -- was Maher hurt by N-word and featuring right-wing trolls?